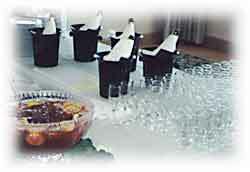 In addition to helping you find the menu that fits your needs and taste I am also an Event Coordinator. I can be helpful in areas such as: organizing rentals, locations, bars, valet, party layout, arranging florist, music, wedding cakes, timing and flow of your event. 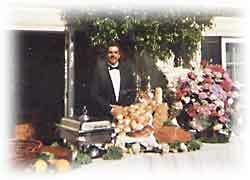 Event coordinating; I am a full service caterer that can help you in many ways. Location: I have many locations that I am very familiar with. I can help you decide which one is right for you based on size of your party, time of year, indoor or outdoor, and budget. If you have a place in mind I would be glad to meet with you to discuss flow, layout, timing, and rental needs. Rentals: I will organize and put together a list of all rental needs. Everything from linen, glassware, china and flatware, to tables, chairs, canopies, tents, umbrellas, heaters, and dance floors. I will source out and order from the rental co. that best fits our needs, considering cost, quality and availability. I will also organize drop off and pick-up time with service location. Note: I have a vast array of Platters, Punch bowls, Baskets, Quality Chaffing Dishes, and serving utensils in my stock. Staffing: I have a great staff, skilled in the kitchen, very efficient servers and bartenders ready to serve you and your guest.They set beautiful dinning rooms, and clean up just as well. Horse and carriage rides, trolleys, or even casino nights. I can book them or simply recommend them. 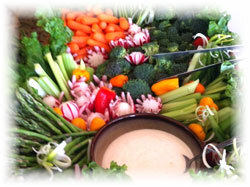 Custom Menu's: On many occasions people have an idea of what they want to have served at their party. I love to try new things and also can't possibly list all the items I am able to prepare. I will try to meet or exceed your expectations. Themes are welcome. Wedding Cakes: I would be glad to recommend some of my favorites to you. Florist: I can arrange for or refer you to a florist that will fit your needs. Valet parking and Limousine services: This can be arranged for you also. When planning your event, please don't hesitate to let me help you.